I have a whole heap of finished project photos to upload. I gave myself two weeks to get everything outstanding done before going back to design work. Nearly made it. Got one sweater not finished but have designed and knitted up a new project for the next issue of www.knitonthenet.com instead, so can only be good. 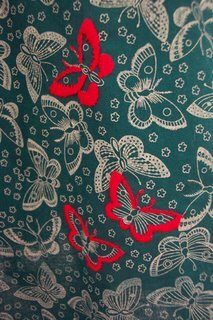 I will also finally have the long awaited photos of my butterfly dress - every time I photographed this dress something was wrong with the images. Finally they seem ok. I've got some lovely yarn from Shilasdair for my christmas project and some gorgeous fabric for my 1950's dress to go with my angora hearts cardigan (See www.knitonthenet.com for free pattern). Again, photos to follow. So excited! 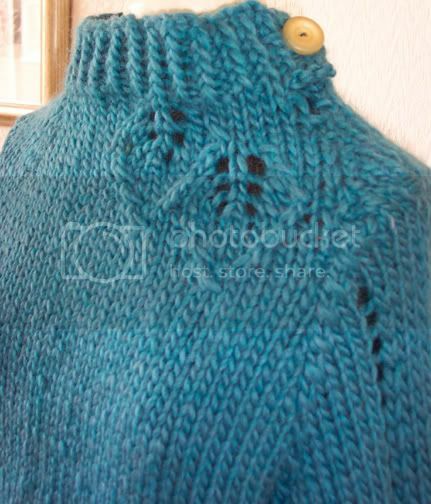 www.knitonthenet.com is online with four of my designs being featured. It looks great. I'm really pleased. All the patterns are free. 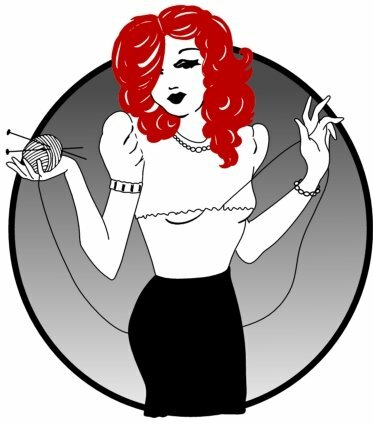 Possible exciting news aswell that my design for knitty.com should be in the Spring issue. I'm working on photos for this project too. Got to keep myself calm and wait for spring!!! It would be wonderful to see my work in knitty. Spent yesterday on the photoshoot for my designs being featured in www.knitonthenet.com. launching on SATURDAY 18TH NOVEMBER. I can't show any of the images until then but will post as soon as possible. They look great. Its brilliant to see your work photographed by a professional. The make up artist couldn't make it so had to do makeup and hair myself, but didnt try anything to clever so seemed to go ok. You can all judge for yourselves soon. 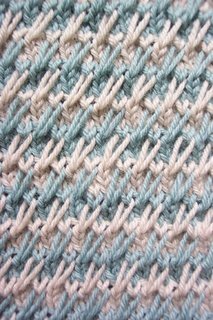 Anyway, hope you all log into www.knitonthenet.com on or after 18TH NOVEMBER to see for yourselves. I really hope you like the patterns. 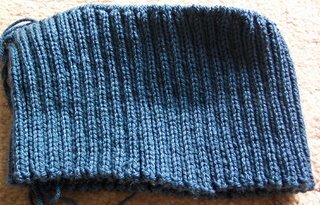 Going to do a little cloche hat I think and some armwarmers and maybe a tank and a sweater - all by November 18th - don't think so - but just can't stop at the moment, the ideas just keep coming and I don't want to stop. This has really been one of those weeks where everything has conspired to stop me knitting or creating. My head is full of ideas but life just keeps getting in the way. The worst culprit has been this computer. Other than completely crashing on me, everything that could go wrong has gone wrong, which has led to day after day of repairing and replacing. I am trying to work on some lovely designs for an online knitting magazine due out November 2006 called www.knitonthenet.com and these are all at different stages and unfortunately I can't show those until they've been published anyway. I'm also hoping a bag I designed for www.knitty.com should be in their December issue. using RYC Cashsoft Aran - lovely, lovely, lovely. This is taking a long time but I think it will be worth it. 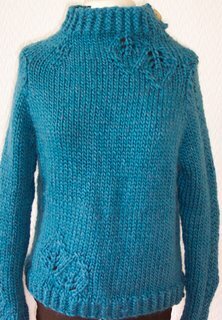 I'm using an old vogue knitting magazine from the late 1950's for this sweater with this wonderful 4-row slip stitch. I'm using Jo Sharp Classic DK wool. 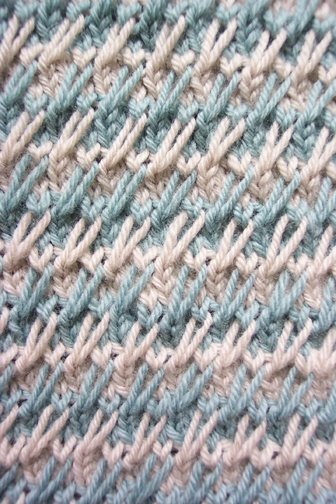 The stitch takes alot of yarn but creates this gorgeous texture. I have one sleeve to go, but with them being raglans they're taking forever. I don't about sss standing for second sock syndrome, I think it should be second sleeve syndrome. 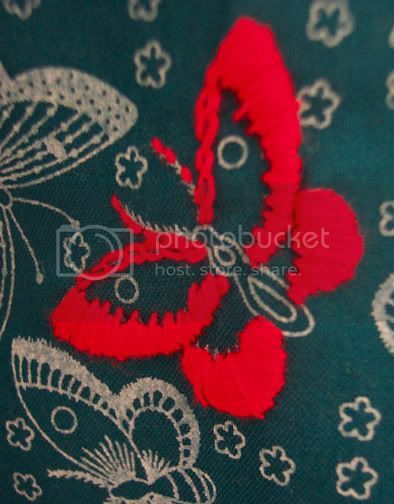 These two photos are close ups of embroidery I did on a dress I recently completed. Its an original 1940's tea dress pattern from Vogue patterns. I used a cotton fabric and picked out some of the butterflies with red thread. I love it. I feel like a lady when I wear it. Will post a photo of the full dress soon. Have recently finished knitting this from the Loop-d-loop book by Teva Durham. Used Freedom wool by Twilleys which is a lovely yarn to work with. Will probably pill easily but hey..
had to do the grafting section a couple of times but found that seperating the top and bottom pieces into matching sections helped; also starting under one armhole so the messiest bits are hidden has helped. Used a 1950's button of my grandmother's for the neckline and am really pleased with the end results. Did not enjoy the grafting one bit. I must apologise. After setting the site up a couple of weeks ago I haven't had time to post so I'm going to do my best now to catch up. 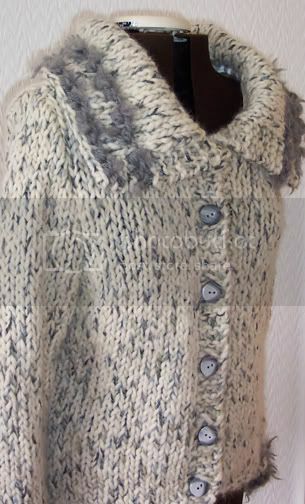 This is a jacket I knitted exactly the same as the pattern, from Rowan Ribbon Twist Collection, called Willow. I also used the yarn specified. It fits lovely, is really snug and the pattern was spot on. Have already worn it to death, however, washing it isn't a lot of fun. Oh, the one thing I did do, which you can just see on the photo is that I bound all the seams with ribbon to hide them. Have spent many hours working on the logo for the site. So here we are..... meet Ruby. I love to make and unmake, to cut, to knit, to sew, to crochet, to embroider, to construct, deconstruct and reconstruct. Above all the aim is to make beautiful, original things. Things you want to touch, things you want to wear, to have, to own. And when they wear out or get too big or too small, uncool or the wrong colour, you can take them apart and remake them. Everything we make with our hands has a history and is something to be proud of. I'm going to use this blog to show some of the things I make, hopefully make some like minded friends, and talk about the things I love.